If you have a unicode font installed in your browser you’ll be able to see the mantra with diacritics here: Oṃ ś&amacr;nti ś&amacr;nti ś&amacr;nti. Like many mantras, this one begins with “Om”. Om has no meaning, and its origins are lost in the mists of time. Om is considered to be the primeval sound, the sound of the universe, the sound from which all other sounds are formed. It’s worth bearing in mind that Sanskrit was the language not only of later Buddhism, but of the Hindu and pre-Hindu Vedic traditions as well. In Buddhist texts, as far as I’m aware, Oṃ is never seen as being comprised of A-U-M. Jayarava has an excellent, if (for the casual reader) rather detailed, article on this on his blog. Shanti (Pali: Santi) simply means “peace”. It’s a beautiful meaning and also a very beautiful sound. The shanti is repeated three times, as are many chants in Buddhism. In Buddhism as well as in Hinduism the threefold Shanti is generally interpreted as meaning the Threefold Peace in body, speech, and mind (i.e. peace in the entirety of one’s being). Wildmind has created a YouTube video of the mantra. If you like the mantra, please give the video a thumbs-up after listening. Simply knowing that the word “shanti” means “peace” doesn’t get us very far. We need to learn how to cultivate peace in our lives. Meditation — especially mindfulness meditation and lovingkindness meditation — is a simple tool for helping us find peace. In Buddhist practice ś&amacr;nti, or peace, primarily means inner rather than outer peace. Through practice it’s possible to cultivate a still mind even in surroundings that are anything but tranquil. It’s definitely helpful to have peaceful surroundings for the development of meditative states of mind, but if one cultivates a mind that is completely nonreactive then it’s possible to peacefully accept the presence of noise and bustle around us. In the long-term, however, some external quiet is well-nigh indispensable for the arising of deep mental tranquility, and so meditators frequently seek out quiet places for their practice. To say that inner peace is what’s important doesn’t mean of course that we can be internally peaceful and yet caught up in all kinds of arguments and fights. It simply means that it’s not possible for us to be in harmony with others unless we’ve learned to develop harmony within our own minds. Ś&amacr;nti, or inner peace, arises when the mind has let go of both grasping and aversion. For this reason the Buddhist path of practice is known in Pali as “santimagga” (Sanskrit: ś&amacr;ntimarga) or The Path of Peace, as expressed in the famous Dhammapada verse, “Santimaggam eva br?haya” — Cultivate this very Path of Peace. “Santi” is commonly used in the Pali texts as a synonym for Nirvana, the goal of Buddhist practice. Meditation and other Buddhist practices can therefore be thought of as the “Path to Peace.” Nirvana is the ultimate in inner peace, and literally means the complete extinction of inner turmoil. the blissful fading away of conditioned mental states. Lovingkindness helps us to still the mind by letting go of conflict. As I’m sure we’re all aware, our hostile or defensive reactions to others are a major source of inner turmoil, and the cultivation of lovingkindness helps us to be more compassionate and less reactive. The “blissful fading away of conditioned things” refers to the mind becoming purified of the delusion, aversion, and grasping tendencies that distort our view of the world and prevent us from experiencing true happiness. So br&amacr;hmaṇo so samaṇo sa bhikkhu. He indeed is a holy one, a renunciate, a member of the spiritual community. Taking peace into the world. Living ethically is also both an expression of a peaceful state of being and a path to peace. In Buddhist ethical practice, this means abstaining from actions that cause harm to oneself or others. In other words, in Buddhist practice we cultivate inner peace but also take peace into the world by practicing lovingkindness and compassion, and by living ethically. The bare minimum is trying to avoid causing physical harm through direct physical actions or through encouraging others to cause harm (the reason that I, and many other Buddhists, are vegetarians). This is the basis of the First Precept of Buddhism, which can also be expressed as practicing lovingkindness. All the other Buddhist ethical precepts — not taking that which is not freely given; avoiding sexual misconduct; avoiding misleading speech; and avoiding intoxication — are ways of living out the first precept. https://www.wildmind.org/mantras/figures/shanti for an explanation & audio of the Om Shanti chant. Very soothing.Very powerful. Very deep. I was interested in “Shanti” because I just saw the movie “music and lyrics” on dvd. And one of the main characters would say “shanti, shanti” (the singer in the movie). I heard them make a reference to the Buddha (cause that’s the singer’s thing in the movie). I caught myself saying “Shanti, Shanti” a few times, quoting the girl in the movie, so I thought that I Google search the word to understand what it mean and came across wildmind.org …and now I understand! Thanks for giving me the knowledge! I must check these movies out. Christianity is the true RELIGION!!!!!! May you find peace, Hannah. Thanks for the very informative article. Like T. S. Tawanda, I watched “Music and Lyrics” and wanted to know what the phrase “shanti shanti” meant. Thanks! In Om shanti, ‘Om’ means myself i.e. in Sanskrit ‘Aham’ and ‘Shanti’ refere to Peace. Om shanti said i am a peaceful soul. All the soul are peaceful,loveful, pure, energitic,blissful. We occasionally end some of our yoga classes with this short chant for peace. I did not know of the interpretation of the Threefold Peace of body, speech and mind as the rationale for chanting shanti 3 times, so I thank you for that newfound knowledge. Namaste. That’s an interesting theory, that Om means Aham (myself) but I have to say I’ve never seen anything that would support that notion. Do you have any sources you could quote that could back up that theory? Om… yes. I have found that there is more than meaning to the word: there is a direct function of the sound. When OM is sung with the ending as “ng”, with tongue touching the palate, there is vibration in the palate up into the head and pineal gland. When sung this way with the yearning of connection with the Divine, and then Beyond yearning, the singing and vibration instills and then one embodies That. Lately I’m into a lot of Reggae, and Shpongle and hippie dressing. Then I watched the movie “Music and Lyrics” and the singer in the movie was Buddhist. I was inspired and decided to google buddhism, learn buddhist hymns, words and their way of living. OM SHANTI. The word itself is so peacefull. Meditaion through these two words brings a lot of change in life. One thing i must admit. All great things, words. history comes from the Great Lands of India. I too watched children of men. Throughout the movie Shanti was spoken…. quite a gruesome flick but It was a good one… a lot of very good points to be proven. I just saw Children of Men as well. Loved Jasper, want his house, interesting discussion they had about truth. Anyone have any comments on Timothy Leary? Shanti is a message of wisdom as it appear in 73 knowledges in Buddhas teachings. We call it Kanti Gnana which is equalent to Shanti in Sanskrit. The agitated mind get calm when we remind the words `take it easy. It is the same base to reming shanti the message of peace. Peace in words, deeds and thoughts which leads to peace and happiness. I’m afraid we can’t offer much in the way ot technical support. With RealPlayer it should just be a case of clicking on the link. If that’s not working I don’t know what the problem could be. We do plan to convert the files to MP3, which would make them more universally accessible. It’s just a question of finding the time to do this. Unfortunately there’s always more to be done than there is the time to do it in. Hi, The word ‘shanti’ may be originally from Pali, but it is not associated only with buddism. In fact the chant ‘om shanti om’ is a part of every Hindu’s life. From North to South, ‘Shanti’ (considered feminine) is a very common name for a woman in India. “Shanti” would originally be from Vedic Sanskrit, which is the language that Pali evolved from. Thanks for pointing out the importance of “shanti” in the lives of Hindus. Many terms (Shanti, Karma, Moksha, etc) are widely used across Indian traditions such as Hinduism, Buddhism, and Jainism, as well as in many traditions that have now vanished. Of course each tradition interprets the terms in different ways, which is largely why they’re different traditions. Be it Buddhism, be it Hinduism, Shanti is a very common expression. Om is sometimes sung “aom” as aom includes all the sounds originating from a human body without moving your tongue. You can also feel each of them in different parts of the body, beginning from the naval area and ending up to the point of your nose. All this you can also feel in your hands and in your arms. I’m just learning it and feels so good. I’m waiting for much more to come. Shanti! The sensation of om/aum resonating through the body is particularly intense if you do overtone chanting, which may be what you’re doing. A former girlfriend of mine who was a professional singer taught me how to do this in a very rudimentary way by channeling the flow of air up into the nasopharynx. True experts can produce overtones that resemble a separate instrument! Thank you very much for the lovely article. I believe that Santimagga is definitely a right path to pursue.. I just saw that movie myself, music and lyrics, and I am seeing the world waking up more and more, as I have been doing the last time..hehe, Its acctually funny, cause i remember thinking it when i saw the buddha in the movie “Yess, Its small, but enough to awaken some curious hearts threw this movie” so i was sure that the cool singer would inspire some. I did not know about shanti either, but it felth like good energy, so its funny that I come across this movie in here, makes me happy. funny, I also found the site after seeing “music and lyrics” :-) and because I wanted to know what shanti means. Thanks for the good informations! And congratulations for your site! I had entirely forgotten about that. Thanks for the reminder. My life has been altered lately with the loss of my fiance. My 18 year old son got a beautiful 8 week old black kitten for me. I named her Shanti as a reminder that through all of lifes turbulance, we need to seek our inner peace. There we will find strength. So thank you to God no matter what name you call him. One universal love. Om Shanti, Shanti Shanti. merci pour la vidéo , om shanto shanti shanti !!!!!! It is truly enlightening to read such beautiful experiences. May the Creator of all that is and is not yet bless you all ways. Om shanti shanti shanti. and now i understand the importance of them no wonder i was captivated by this phrase. Yeah, that’s a great verse from the Dhammapada. The word translated there as “brings peace” is the verb upasammati (meaning to grow calm, or to settle) rather than shanti, but although the terminology is different it’s essentially the same meaning. May there be Peace Peace perfect Peace. I like this website a lot. I just found it today while looking for different mantras. I noticed one that means (May all beings be free from mental suffering) this rings true to me because I do suffer from manic depression and going through a divorce which is not a stable thought for my mind. I have been learning about Buddhism for about 4 years now and find if calming. Out of all the mantras though this one is my favorite so far. How interesting, Nigel. I’d imagine it’s just a linguistic coincidence, but it’s a nice one! Wish I could read Romanian. I just wanted to also point out that the “om” symbol (or the modern hindu symbol) is made from a conjuction of devanagari vowels for “a” (Ã Â¤â€¦) and “u” (Ã Â¤â€°) and the chandrabindu “the moon + dot” (nasalitation of the vowel aka “m” sound) thus a proper iast transliteration should be auṃ. The romanian om is from latin homo which is derived from greek homos which means same or one. It is not impossible it is related, but I have not seen any reference to this. You’re correct that om was originally AUM, but depending on which Indian language you’re dealing with, an “au” and an “o” can be equivalents. For example “Gautama” in Sanskrit is “Gotama” in Pali and no doubt in other Prakrits. Monier Williams Sanskrit-English Dictionary also says that “originally oṃ = &amacr;ṃ” — I don’t know where that leaves us, though! It makes perfect sense that Romanian “om” is from Latin “homo.” I suppose it’s essentially the same transformation as “homo” > “homme” in French. I don’t think you’re correct though in saying that the Latin “homo” comes from the Greek “homos.” I understand that it comes from a Latin root meaning “earth” or “born” which essentially means that we are “earthlings,” I suppose! 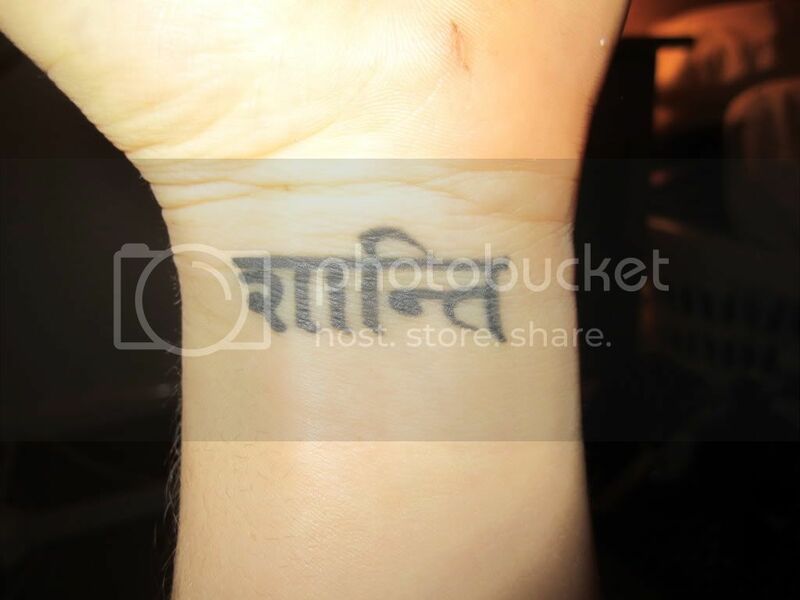 What i meant was not the pronounciation or derivation, but how the symbol itself is a devanagari scripted word. I don’t disagree with you in that matter. In pali the “au” (devanagari Ã Â¤â€) in gautama is of “o” in the brahmic scripts as “au” didn’t exist, so the “sanskrit” version is a transliteration from brahmic and probably sounded closer with “au” than “o” (devanagari Ã Â¤â€œ) for those who did the transliteration. The “au” vowel sounds like a pure vowel or diphthong depending on where in india you are, even within the same languages. And for those who are not confused enough yet “au” vowel is not the same as the “a” + “u” I mention in the previous comment which are two different vowels but conjuncted in the symbol. Where it leaves us, I don’t know. It is something divine for most indic religions and to declare one simple meaning or way, at least in this small space here. The sanskrit omkara (Ã Â¤â€œÃ Â¤â€šÃ Â¤â€¢Ã Â¤Â¾Ã Â¤Â° or iast transliteration oṃk&amacr;ra), the meaning “the om word” may imply a “simplified name” for the sound which is different from the way it is uttered. No problem — it was quite clear you were talking about the devanagari characters. I was just adding that A-U-M is also said to be the original pronunciation of the word, and also that in Prakrits “au” has often evolved into “o” — and evidently in Sanskrit as regards “oṃ”. Presumably the devanagari is a reflection of an orginal pronunciation. peace to you always and keep “The Word” rolling from the tip of the tongue within your soul and not your mouth…. other Nichiren Buddhists are. After having read your explanation of this mantra, I do think I’ll incorporate into my practise. I really liked hearing the mp3 file, and think this mantra is definitely helpful. Funny thing: I, too, first heard this in the movie Music and Lyrics and thought the character must’ve been making it up, since her character’s a bit of a bint–well, a well-meaning and clearly spiritually curious bint, but a bint nonetheless! Please feel free to e-mail me if you would like to remain in touch. I was just doing some spiritual exercises – a different chant, when the words….om shanti..came into my mind. Unsure of what the shanti meant I found your site. Thankyou for enligtening me. We have sabbe satta sukhi hontu here as well. Good suggestion. Actually I have that program already. And our mantras should be available in MP3 format, but the MP3 player plugin is currently broken and the developer hasn’t yet fixed it. At some point soon I’ll get this all sorted out. my interest in the mindful way of seeking peace within as well as sharing with others around me is a new path for me. I am intrigued. I think this is useful in creating a peaceful way of being. … I am grateful. thank you for sharing. Om..
ialwayas look this program on astha channel i liked this program very much ,it has changed my lifestyle,thinking pattern. I saw the movie Om shanti om, and i knew it meant something religious, but i wasn’t sure what exactly. I’m also developing a liking for hindu art, and found the website while scouring for images. I’m introducing meditation to my 17 y/o who struggles with his gifts and puberty. This is helping us both deal with our communication and respect for each other. Allowing a person to find themselves is the best way for them to deal with themselves. For those who are on a quest for peace in this chaotic world, if there is no understanding, allow peace and not judgment during the journey…may you all find peace…thank you. Hi, I’m very interested in mantra yoga and have recently decided to chant Om shanti shanti shanti for 30 days. I have been taught that every mantra has a specific raga (ragini or melody) for it. I am trying to figure out what the proper raga/melody for this mantra is. The mp3 file you posted sounds nice. Is it chanted with the proper melody? I’m afraid I’ve never heard of their being specific ragas for Buddhist mantras. I’d imagine it’s something that applies in Hindu practice. 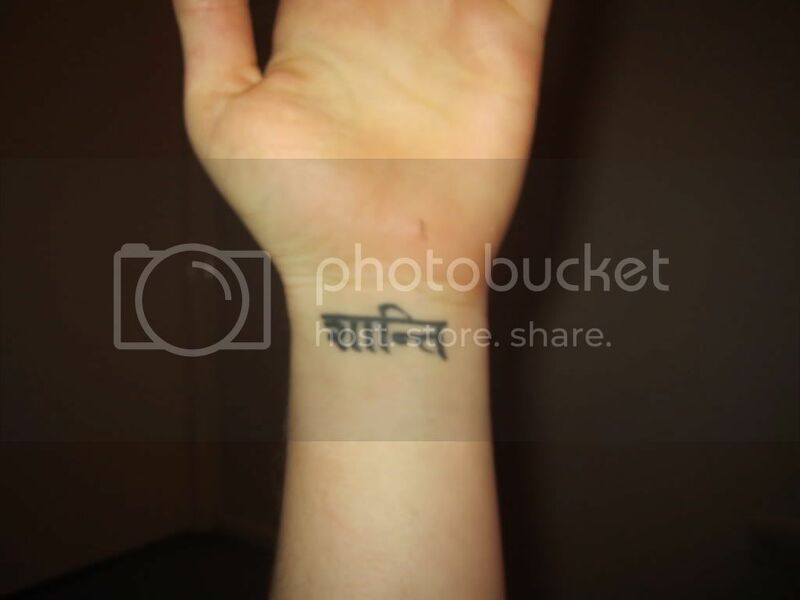 hi i wanted to just say that i recently got the Sanskrit word shanti , tattooed on my wrist in small writing , i really respect the Buddhist beliefs so i hope i have not offended anyone … i chose the word as it is supporting , reminding me what to work towards and helps comfort me by reminding me that we all poses the power within us to achieve peace . Not a lot of people understand the significance of this word but i find it beautiful . To finally obtain peace within ones self is the complete acceptance of ones being. Which is an amazing power we all have , just need to be on the right path to get there , good luck everyone . I can’t imagine anyone taking offense at that. It would be rather ironic if they did. Do you have a photograph online anywhere? Thanks! It looks beautiful. We’re actually going to be having a piece in our blog soon (I hope) about Buddhist tattoos. I felt very peaceful listening to the chant. nice site! I “heard” (because I am not sure if I am really hearing) the word “Shanti….. Shanti” in my ear while I was travelling home. A lady was whispering it. I felt that energy, it was so strong even though that lady was whispering. I have no idea what it means. hi…thank you for the explanation… I was just browsing to find the meaning of Shanti. I’m Catholic,..and I’m chanting ‘Om Shanti’ before/after I meditate. I do yoga while saying the prayer ‘Our Lord’ in my heart. When we know the meaning…It’s universal. Religion is a foundation, but I can add with whatever that makes me feel closer to God and make me a better person. I’m sure Jesus don’t mind :) So does Buddha. Namaste. Peace be with us. I’m becoming interested in Buddhism and have been reading up on it from time to time for several years. The only thing I have not found is where if any is the starting point. I’ve learned about many practices, but I have not known which to start with to start this journey. Any help would be appreciated. It sounds like you’ve already started, at least with the searching. Please don’t undervalue having got to that point. As far as practice goes, you can’t do better than starting with the Mindfulness of Breathing practice, followed closely by Lovingkindness practice. The two are complimentary meditations. No matter how many times you participate in your kirtan yoga class, this last prayer practice is the one that sends energy through one’s entire being. We can imagine a world that would pray this simple prayer for peace. Put this page on your favorites, and pray it every day. Be mindful of your own personal intention for peace, and it will come to you. Offer your own devotion to non violence. Namaste. gud to see the word shanti or peace in hindus l…….well Jesus was the prince of peace…. n more ovr prophet muhammad use to greet evr1 using peace be apon u….so all religion unit people…so all my frnds live in….peace…. I have been replacing my minduflness meditation (counting the breath) with using a mala and chanting Om shanti, shanti, shanti. I find it feels better/easier and is more quieting of the mind. Would you say this is’ok’? Is there a right or wrong way or am I ok doing what feels right? That sounds good. In the long run mindfulness of the breathing has more benefits, but in the short-term using a mantra can be a very quick way of calming the mind. We’re so used to thinking that it’s helpful to have a form of meditation that actually uses thinking. I do 20-30 mins every morning at 5.30 and then try and sit for 10 mins or so (as long as children will allow) in the evenings. Do you think better then, mindfulness of breathing /metta b every morning – i.e. 1 on 1 off in rotation. And then saving the om shanti chanting for the evening sessions? Hi, i’ve enjoyed these comments and the article above very much. I came to this site looking for the meaning of Om Shanti Om as it is a message on a person’s page of a meditation app I use. It is lovely to make connections with other meditators through this app and find out new things about pali and sanskrit words that I have heard and used at various times but never really understood fully the richness and depth of the meanings they hold. I really like this website. found a nice article by Jack Kornfield on it and he was quoting Ajahn Sumedho. Such ‘venerable’ teachers! I such add your page to my favourite meditation websites and will be only too happy to share my knowledge of this site with other friends through twitter and email etc.. I was born into Christianity and I am a Christian. However, I believe God is God and each of the many cultures on this planet all pray to a higher being, a divine spirit and I don’t believe there is any one superior culture that practices a superior religion. I do not think as humans we are superior beings as well and someday our very existence in this world may be in jeopardy no matter our religious faith. If there weren’t so much prejudice in this world, and if people could learn to step outside of the box, out of their comfort zones, they would overcome their fears, which is what prejudice boils down to… fear of others because they live differently and have different beliefs than yours. There are cultures and people living under the influence of bad leaders whose views and perceptions of what is right and wrong are distorted, toxic and poisonousness. Bodhipakasa, Thank you for your well written and informative article. The mantra is wonderful, the moment I pressed the play button vibration surged through my body; chills, and happiness all at once. I enjoy the conversation here .. one can connect deeply even through cyber space. Ommmshanti all. sending love, and power from Yosemite Ca. Jo P.S. will hit the play a few more times now! If shanti means peace,then its ok by me.But if its the name of a gods or goddess,am out. The beauty of Shanti Mantra is that it can be recited on any occasion, sad or joyous; anywhere, anytime. Thank you for sharing this beautiful mantra. I am going to use it in my daily practice!